about the space,you want to fly to the sky to find out what is in that.Do you have a child dream to be an astronaut in a specesuit? That is so cool! 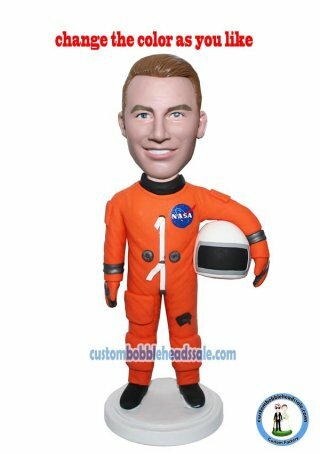 For now, why not ordering this customized bobblehead who in an organge NASA astronaut outfit carring his halmet on arms . This custom astronaut bobblehead is very intresting decoration on desk or your bookself. And it's a very nice gift for the one who is an astronaut or the one who want to be an astronaut in the future.